12th March 2012, London – A record of half a million people visited the award-winning 1001 Inventions exhibition during its recent outing in Los Angeles. Following blockbuster residencies in London, Istanbul and New York, the world renowned exhibition has achieved its largest audience to date as 500,000 people experienced the interactive 1001 Inventions show between May 2011 and March 2012 at the California Science Center. 1001 Inventions introduces the enduring legacy of Muslim civilization to family audiences across the world. Modern society owes a tremendous amount to the Muslim world for the many groundbreaking scientific and technological advances that were pioneered during the Golden Age of Muslim civilization between the 7th and 17th centuries. In 2011, 1001 Inventions was crowned “Best Touring Exhibition” of the year at the annual Museums and Heritage Excellence Awards in London – considered by many to be the “Oscars” of the Museum world – fighting off stiff competition from some of the world’s biggest names in exhibitions. Following its record-breaking residency in Los Angeles, the 1001 Inventions exhibition will be open at Washington DC’s National Geographic Museum from August 2012 through February 2013. 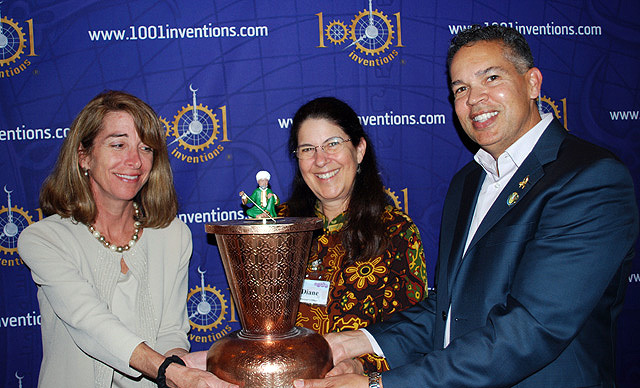 As part of the ceremonial transfer of the 1001 Inventions exhibition from Los Angeles to Washtington DC, Dr. Diane Perlov and William T. Harris, Senior Vice Presidents of the California Science Center (CSC), presented Kathryn Kean, Vice President of Exhibitions at National Geographic, with a reproduction of the "Scribe Clock" – a 13th century invention by master engineer Al-Jazari, who is one of the central characters within the exhibition.